Oatmeal muffins are always great, but when you throw in some unsweetened applesauce and chocolate whey protein powder they get even better! Try out this fantastically frugal decadent dessert or savory snack and skip out on the extra sugar. Preheat oven to 350 degrees. Mix eggs, vanilla, applesauce, banana and Truvia / Splenda together in a bowl. Add in oats, salt, baking powder, flaxseed, Chia seeds, chocolate protein powder and cinnamon – mix well with wet ingredients. Finally pour in unsweetened soy milk and combine. 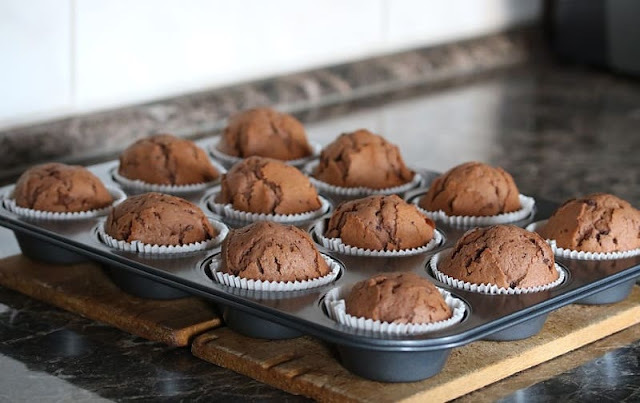 Spray a 12 and 6 capacity muffin tin with cooking spray or use cupcake liners. Pour mixture evenly into muffin tin cups. If using toppings add them onto the tops of muffins now. If using fresh or frozen fruit, drop it right into the batter. Bake 30 minutes until a toothpick in center comes out clean. Cool then enjoy or freeze them in gallon freezer bags and enjoy the low sugar protein power to stay lean! I hope you enjoyed this free healthy recipe for reduced sugar baked chocolate oatmeal protein muffins on a lean budget.